How many words in the English language are there to express a sentiment of utter shock? “Stunned” is my current favorite. It shouldn’t “stun” me that the administration partakes in or supports extra-constitutional activities; after all, the past four years have done nothing but clarify the same; but I had a little more faith in the Supreme Court of the United States. I’m not a betting woman, but if asked I would have bet money on Justice Kennedy defecting to uphold the Health Care law mandate, but John Robert’s Benedict Arnold-like actions left me stunned. Do not misunderstand me- Roberts is no “conservative,” but in a case that so many thought was open and shut, it shocked many to see Roberts make the decision that he did. I might also point out that Senators Obama and Biden voted against the appointment of John Roberts during his approval process; a fact that makes the following hilariously ironic. Ok campers- let’s get down to the nitty-gritty. What exactly does Thursday’s epically bad decision mean? Prior to its reaching the highest court in the land, 26 state attorneys general filed a lawsuit against the Affordable Health Care Act or “Obamacare” in protest to (among many other complaints) the “individual mandate” clause within the Act. This clause mandated that every American purchase insurance or face a penalty. The gargantuan problem with this is, of course, the government cannot constitutionally force a person to PARTICIPATE in commerce. The original intent of the government’s involvement in commerce at ALL (the commerce clause, Article I, Section 8, Clause 3 of the Constitution) was to ensure that one state could not impede commerce for another. That is, for example, that Texas could not willingly promote activities that purposely inhibited commerce for Louisiana. That’s it. Of course, we’ve come miles from that with a literal library of regulations the federal government imposes upon commerce. . . . but as overreaching as these things may be, COMMERCE is actually taking PLACE. This mandate as outlined in the health care law would set the precedent for the federal government to be allowed to demand that a person participate in a form of commerce when they had not previously been doing so. The penalty penalizes inaction. In a technicality, the Court found a way to get around the commerce clause (Roberts even admitted that if levied under the guise of the Commerce Clause this mandate would have been unconstitutional . . .) and instead called it a “tax,” stating that since because Congress has the power to tax, the mandate would then be “constitutional.” In a 5-4 decision with Bush-appointee Chief Justice John Roberts defecting to the left of the court, the Supreme Court made one of the most activist decisions yet to date. There’s more than a few problems with this, aside from the fact that the mandate on its face is so horrendously intrusive and unprecedented. First, the President, his administration, and Democrats everywhere (because this law, as will be discussed later, was passed without bipartisan support in the least) scurried around for months saying that this was not in fact a tax. The most infamous of these denials (and by now, the most widely circulated) was an exchange between CBS Host George Stephanopoulos and President Obama in 2009. Click here for that exchange. In that interview Stephanopoulos pressed Obama about whether or not the penalty for not buying insurance was a “tax;” a claim the President vehemently denied. OBAMA: No, but — but, George, you — you can’t just make up that language and decide that that’s called a tax increase. . .
Well that’s funny, because John Roberts and the majority opinion in the Supreme Court just did! I must say, Mr. President, your victory lap after the Court’s decision seemed to indicate nothing less than full agreement with the decision; a decision based upon a taxation concept that you wholly dismissed and denied in that rather annoying interview with Mr. Stephanopoulos. Secondly, there’s the pesky little problem of the Anti-Injuction Act. You see, technically speaking a court cannot hear cases regarding taxation until after the tax itself has been levied and paid, at which point it can be challenged. Since this mandate was described as a tax exactly ZERO times in the Affordable Care Act’s verbage, the lawsuits filed and their subsequent audience before the Supreme Court was completely legitimate. But since it was defended as a tax in the argument and then final decision, that should technically come under question. I realize that’s overly simplistic, but in essence, that’s what happened. Roberts made it clear that under the Commerce Clause this would have been illegal, but under Congress’ power to levy taxes, presto-chango, it’s Constitutional! Um, excuse me CNN, but this is no nudge. I either buy insurance or pay the tax. This isn’t a suggestion, it’s a mandate. This sets an absolutely terrible precedent. This law mandates that we participate in commerce (as much as they argued in the Supreme Court that it does NOT fall under the Commerce Clause!) as a condition of simply existing. What’s to stop the government from deciding that since fatty, fried, or sugary foods and drinks can cause health problems, those things should be banned in certain quantities because it may affect the overall healthcare industry? Oh wait, it’s already been done in San Francisco, where Happy Meals were banned, and in New York City where soft drinks over a certain ounce size were banned from sale. Food justice? FOOD justice? That’s funny, because I don’t think I’ve ever once walked into a McDonalds and saw guerrillas with AK47s standing behind a mom and her child, hissing “You BETTER buy that Happy Meal or ELSE!” Anyone? Anyone? Gees. In the same breath, (and more related to this Court’s decision) what is to stop the government from deciding that you must purchase certain foods that the Secretary of Health & Human Services has deemed “healthy” because that might reduce illness in this country, and therefore reduce the cost of health care? Now that the Court validated Congress’ right to tax as a consequence of inaction, there’s really nothing that they couldn’t mandate. Justice Roberts took a horrible idea and found a way to make it “work” via a technicality, and now the precedent is forever embedded in the American justice system. The Court should have simply (and rightly so) ruled that cutting off federal Medicaid funds from the states as a consequence of not cooperating was unconstitutional and left it at that. Instead, once again, the Court played the judge who tells the criminal defense lawyer how he SHOULD have argued the case! In this case, actually- the Court played the judge who tells the person on trial how he SHOULD have carried out his actions. . .
By the way- stop and think about that Medicaid silliness for a moment. It’s as if the federal government looks the states straight in the eye and says “you had BETTER cooperate. . . or ELSE.” How very mob-like. Of course, that shouldn’t surprise us either. Furthermore, here’s an administration and a party that screams all day long about how it’s REPUBLICANS that want to push grandma over a cliff by simply reforming Medicare/Medicaid, when it’s not the GOP but the Left that threatens to pull federal Medicaid funds out of any state that so much as questions the implementation of this law. That’s a convenient double standard. By the way, the court’s “solution” to the constitutional problem; that is, that only “extra” funds could be cut off, is STILL allowing the federal government to coerce a state into compliance. Furthermore, how is strong-arming a state into cooperating with this law or face a reduction in Medicaid funds unconstitutional, but strong-arming an individual into buying a policy he or she either cannot afford or does not want, CONSTITUTIONAL? May I remind the Chief Justice of the fashion in which this law was passed. It was passed in a cloud of bribes and an accelerated process of passage known as “reconciliation.” In other words, this bill was passed with quite a few states’ elected officials kicking and screaming, as was made clearly evident when 26 states sued the federal government. The administration and supporters of the bill had to fight tooth and nail to get it passed at all. Excuse me, Justice Roberts, but this was not OUR political choice. This was Barack Obama’s political choice. My mind continues to spin in what seems like an endless array of double standards and shades of gray. If you take nothing else away from this post- take this: The Supreme Court diminished your personal liberty and the sovereignty of states on Thursday, and for the LAST TIME- you’re NOT getting free health care. There are free-market solutions to the problem of health care and insurance costs, but rather than explore those, the administration (now with the full backing of the Supreme Court) further expanded the federal government and put it in place of your own common sense. Apparently, America, your citizens and your free markets are too stupid to figure out how to take care of things on its own. And last but certainly not least, from the president who promised that taxes wouldn’t be raise a red cent on the middle class comes the largest tax increase in American history thanks to this law. When the Bush tax cuts expire in January and the average family making $50,000 or more a year will see their taxes go up an average of $3,000 a year. 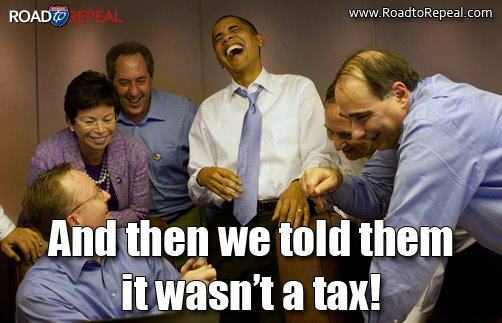 . . then add in the Obamacare tax. . .that aught to be a real joy-ride. As many have pointed out, this still remains a vastly unpopular law, (as of this week, 54% of Americans support repeal while only 39% oppose repeal), and November is just around the corner. You may have won the battle, President Obama, but America will win the war.